We should have been warned! 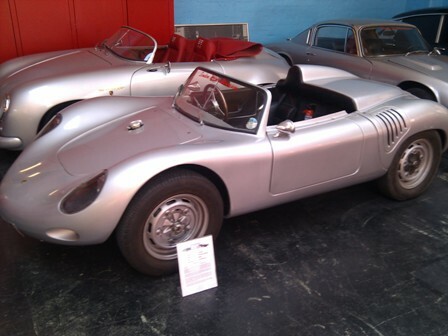 Yesterday I visited the London Motor Museum. I suspected something was amiss when I noticed I was the only one not on the payroll who had walked through the doors of the “museum”. I paid my ten (!) pounds to the young man who quickly closed whatever internet window he wasn’t supposed to be watching on the computer at his desk, and was eager to see what interesting displays might await me beyond the double red doors. 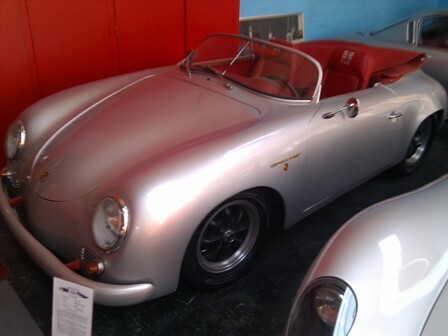 As I first walked in, I was standing in front of a pair of silver vintage Porsches: a 356 speedster and 917 RSK. Not a bad start, but they both seemed a tad ratty. 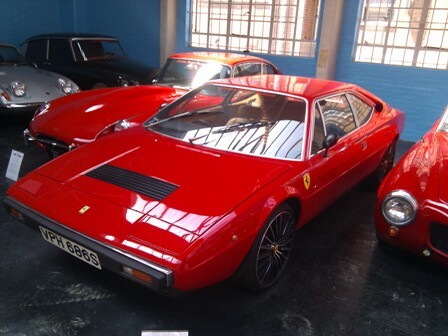 Luckily, I noticed just beyond them sat one of my favorite Ferraris of the 1970s (and in sharing this opinion I’ll be destroying my credibility with my automotively-informed friends to admit that this model qualifies for such a list), the bertone-designed Dino GT4. I moved in to take a closer look and immediately spotted them. They weren’t just the wrong wheels. Nope. This was the automotive accessorizing equivalent of painting a mustache on Mona. This was an egregious failure in the automotive aftermarket. What this particular example was sporting instead, were the equivalent of the white alligator-embossed ‘pleather’ loafers worn by a down-on-his-luck pimp. I was amazed that someone went to the effort to cast a design so appalling, and that they had the chutzpah to place a prancing horse crest in the center cap. 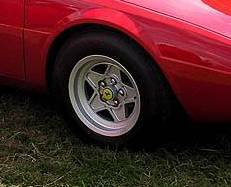 I can only imagine how humiliated the hapless designer of these wheels was to be fired after the product line achieved a whopping 4 units sold (worldwide!) and the other 2,000 units cast had to be scrapped to make room for more “commercially viable” designs. 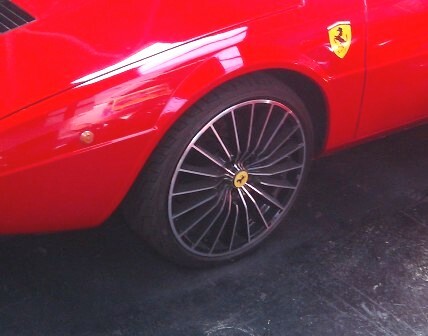 How fortunate I am to see such a rare wheel in person. What would Enzo say if he were alive to see what has been done to the car bearing his son’s name ? What’s italian for “Tres guache”? Glancing at the two Porsches only 5 yards back, I now realized that they weren’t Porsches at all. The proportions were all wrong. The aluminium skin looked somewhat…heavy. THEY WERE REPLICAS! Fiberglass facsimiles. And not particularly good ones at that. These were budget kit cars and they looked to have been constructed by laid-off Yugo factory workers. They had more glue smudges at the crooked panel edges than on the outside than my 10-year-old-son’s Kindergarden popsicle stick log cabin project. Just to confirm my suspicions I walked over and looked through the rear vents of the RSK, where the beautiful 1.5 liter 4-cam engine would normally be mounted. Where I expected to find Stuttgart’s diminutive mechanical masterpiece, there was mounted instead a rusted out VolksWagen powerplant that probably hadn’t been running since “Mork and Mindy” was in its premiere broadcast season. I quickly walked through several adjacent rooms as my spirits sank lower and lower. This wasn’t a museum–It was a fraud being perpetrated on unsuspecting tourists. I began to appreciate why I was the only one in the museum for the hour or two I was there. Disgusted with the whole experience and the many hours I had already squandered on this trip, I walked out. I may have been ensnared by the coyote trap that is the London Motor Museum, but I have chewed off my trapped limb to make my escape. I was so profoundly disappointed I would gladly consider chewing off the other limbs to ensure it never happens again. Now back outside the “museum” in the beautiful Spring London sunshine, I could feel my mood beginning to improve. I was half way back to the Hayes train station when I suddenly realized what a colossal mistake I was about to make. I have an obligation to my fellow automotive enthusiasts, those obsessed men and women who would squander a beautiful half-day in one of the world’s most beautiful and interesting cities to look at driving machines. I must protect the others and I would need evidence for those I wished to protect. I must subject myself to another painful visit to this offensive establishment. I must go back and take pictures. The only other possible explanation is that “Dingy Warehouse one half hour outside central London only accessible by infrequently running trains and full of shoddily constructed kit cars and plywood shell facsimiles of movie props” didn’t develop much traction with the marketing team. 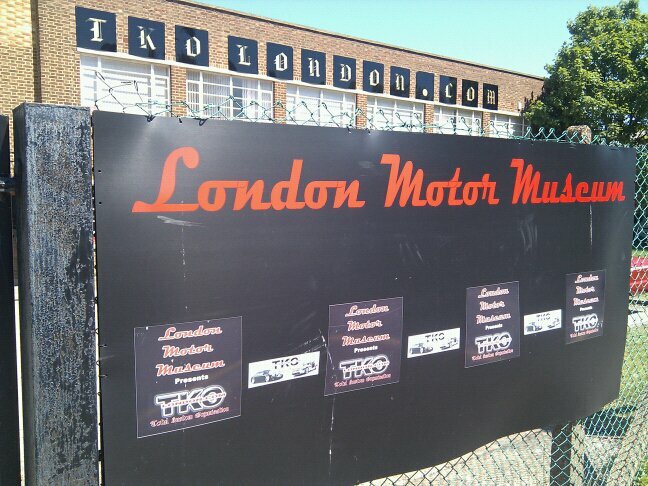 Calling it the London Motor Museum is an insult to Motors, Museums and the cosmopolitan capital defamed in its name. 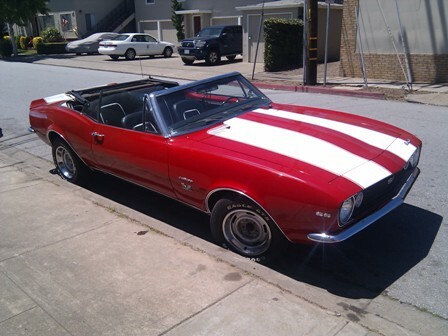 Ken kindly sent us a note to correct my error in the Lurking outside the garage post a few weeks ago.Â I incorrectly identified both Camaros as 1969′s.Â It turns out the red one was a 1967.Â Thanks for the correction Ken — I appreciate the help. Yesterday was a full day at the garage. We started early, heading out for breakfast at eight at a favorite local restaurant. Revitalized with corned beef hash and eggs, we then headed to the garage. While my dad set up, he (much to my reluctance) had me read all the instructions for engine disconnection and removal before we started. Once Dad and I were fully ready to begin, we headed out for quick haircuts. On the barbershop TV, we were shocked to see Johns Hopkins’ defense obliterated in a lacrosse game against Duke. The final score was 18-5, Blue Devils. Back to the garage. 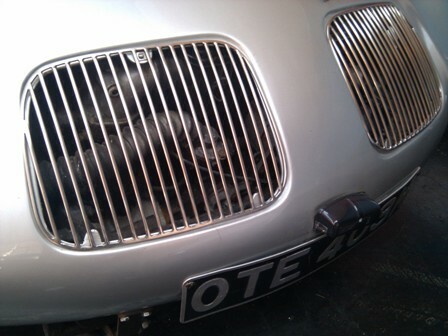 I started by taking off the air cleaner, then draining and removing the radiator. To protect the core fins, we cut a square out of the cardboard box that held our engine cradle, and taped it to the side of the radiator. 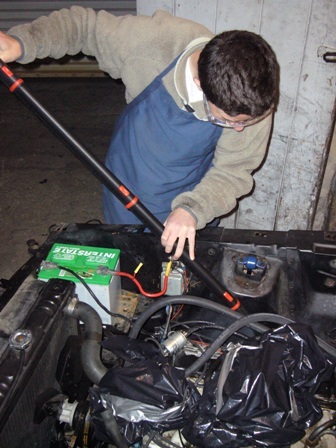 After removing the fan and throttle linkage, we started on hoses and wires. The book, and my dad, were very clear in their reminders to take many pictures and flag wires with masking tape for reference. 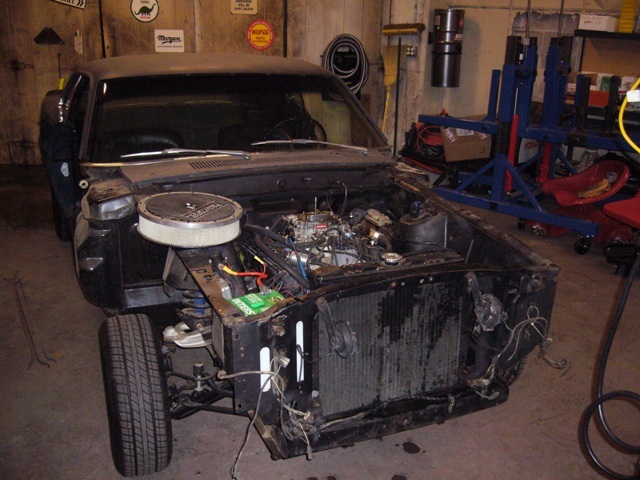 There were hoses leading to the power brake booster, theÂ carburetor, the intake manifold, and many other places. As for electrical wires, there was a wiring harness that ran along the inside of the left valve cover, with many wires spreading out. 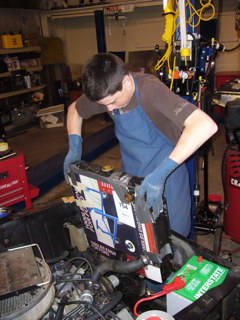 The most difficult part was removing the starter motor cable, because it was connected to the bottom of the block with a bracket. Next off came the power steering booster. Then, we took a break to go to an end-of-the-year party for my lacrosse team. We had fun passing a ball around, and Coach awarded me Best Team-Player (in other words, most helpful). We returned to the garage after dinner. Having applied a penetrating oil a couple of hours before, Dad and I painstakingly removed the bolts connecting the exhaust manifold to the block (a small-block V8 leaves very little wiggle room in between the engine and the compartment walls). At this point, we jacked up the car to access the bottom bolts connecting the exhaust pipes to the manifolds. Exhaust manifolds out, Dad removed as many bell-housing bolts as possible from the top, and then sent me under the car to finish the job. After doing some research to find out where the converter was, we discovered that our car had no converter cover to remove. Next, the book said to crank the engine with a remote starter to spin the converter and show the converter-to-crankshaft fasteners. 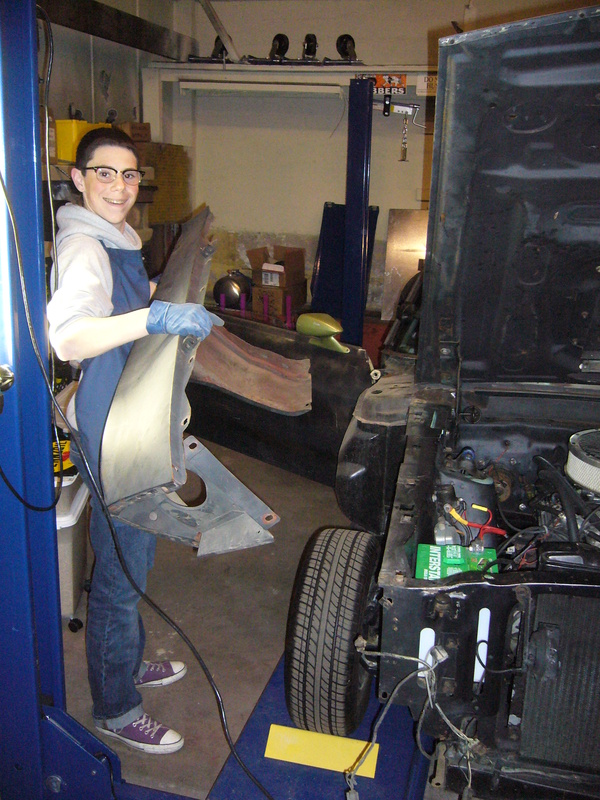 Removing the alternator was the last step before engine removal. 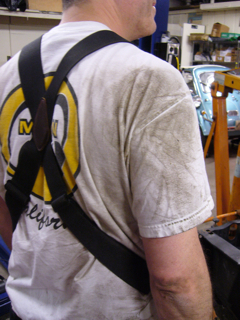 We lowered the car and hung the engine load leveler on the cherry picker, but it was much past my bedtime by then, so we decided to call it a day. Dad gets dirty while I hog the creeper. We won’t be able to finish until Dad returns from his business trip to London. In the meantime, I brought back a bin of small parts and fasteners to catalog in our parts inventory. Jack and I set out a very ambitious day for ourselves yesterday.Â We were booked until 1:00 in the afternoon on various non-automotiveÂ activities (because it’s important to have others believe we gearheads lead a balanced life) andÂ were scheduled to meet my friend Adrian with his wife, Lianne, at the Three Lions Garage at about 2pm.Â Adrian and Lianne were driving their beautifully restoredÂ classic MustangÂ down from their home in Marin. They were making the long drive to give us an opportunity to see Adrian’s handiwork and to take us for a drive. I was confident the visit would help inspire Jack with ideas and give him a taste of what is possible after the many months ahead as we navigate his project.Â As an incentive to Adrian for making the drive from their home in Marin, we offered to give them a tour of the Candy Store (a local car collector club). Adrian and Lianne arrived to find Charlie and Ollie putting their refined decorative touches on the Three Lions Garage.Â Jack and I were down the block picking up the cherry picker we’d need to pull his engine from Dan at Burlingame Mufflers.Â As soon as we returned, we were immediately distracted by the beautiful red convertible just outside the doors. 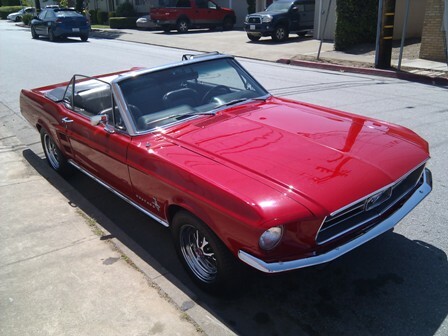 Adrian did the restoration on his 1967 ConvertibleÂ several years ago and we were really impressed with the quality of the work.Â We spent quite some time going over Adrianâ€™s car and he patiently answered dozens of questions. He was kind enough to share many of his tips with us.Â These will undoubtedly save us time and trouble as we continue through our project. We had a plan to steam clean the engine this weekend to prepare for pulling the engine / transmission on our next session.Â But we were having such a good time chatting with Adrian about the project, that the day got away from us.Â By the time we started to wind down the Q&A session, we had just enough time left over to take a trip to the Candy Store.Â Adrian was happy to let me drive the mustang if I let him drive the Carrera (and it sounded like a fair deal to me). After about an hour and a half touring the collection at the Candy Store, Adrian and Lianne had to leave to head home. I was feeling some pressure to help Jack make tangible progress this weekend before leaving for a business trip to London next week.Â Since we didnâ€™t get much done yesterday, we decided to return to the Garage this evening to steam clean the engine.Â It was quite a sight to see me drive whatâ€™s left of Jackâ€™s car at this point out of the Garage to turn it around (so the exhaust would be directed OUT of the doors) while we ran the engine for a few minutes to warm it up before applying the degreaser.Â We let the degreaser sit for about 10 minutes (and ran the big fan to vent the noxious fumes coming off the hot exhaust manifold). Â Â We then went to work with the steamer. After about one hour of non-stop steaming, were pretty happy with the results. 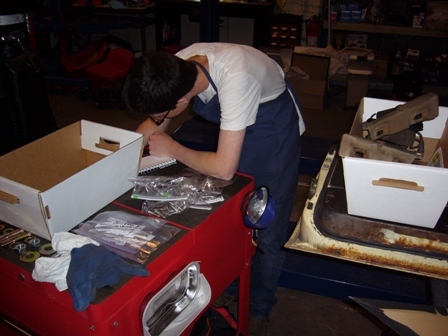 being the dutiful son of an mean and unreasonable man, Jack isolated each set of parts in its own zip-lock bag, which he numbered and indexed with an inventory list heâ€™s maintaining in excel.Â Each part is stored in a numbered bin on a numbered rack, making it easy to retrieve as needed. Hey Sal! How's it going? When are you going to come visit us? 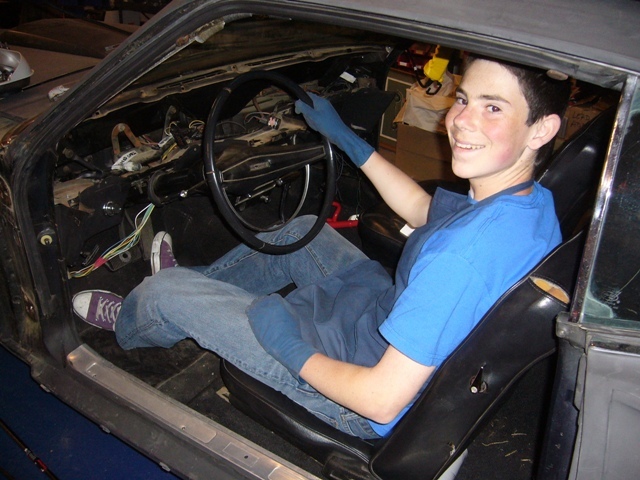 Yo Jack, Go with the shaker hood. Very nice refined look. Today I saw the most remarkable sight just outside the doors of the Three Lions Garage. Parked mere yards from the large garage doors were two 1969 Chevy Camaro SS’s (a 1967 and 1969)! That’s right–two of them! This was no coincidence. They just knew. They must have felt it in their sub-frames. That just beyond the plain locked doors, unspeakable violence was being committed. 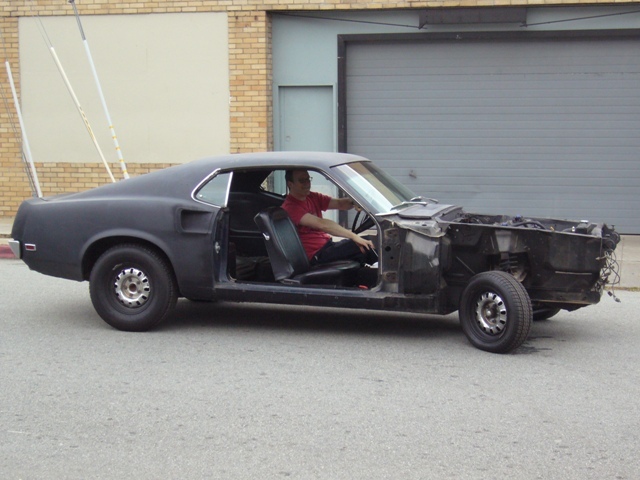 A 1969 Pony–their arch nemesis–was being mercilessly mutilated. Bit by FoMoCo bit. Slowly and painfully. With implements specifically designed to tear the extremities, skin and innards from the savage beast. They wanted to be nearby just to enjoy it. To gloat. To wallow in its pain. To ensure the sounds of its dismemberment were not wasted on the unappreciative. 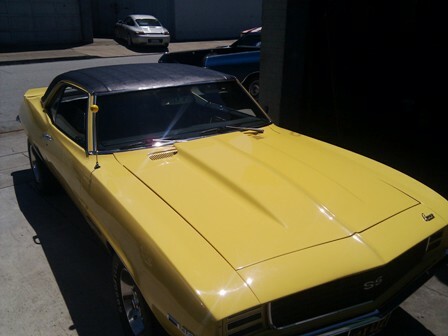 The red Camaro is a 1967, only the yellow one is a 1969. You are currently browsing the Three Lions Garage archives for May, 2010. 67 mySQL queries in 0.224 seconds.